Today we saw the launch of the latest in the line of Honor phones. Each year improving over the last with more style and value packed in. This year we see greatly improved looks, commendable specs and some of an new approach to make the Honor stand out in it’s price range. 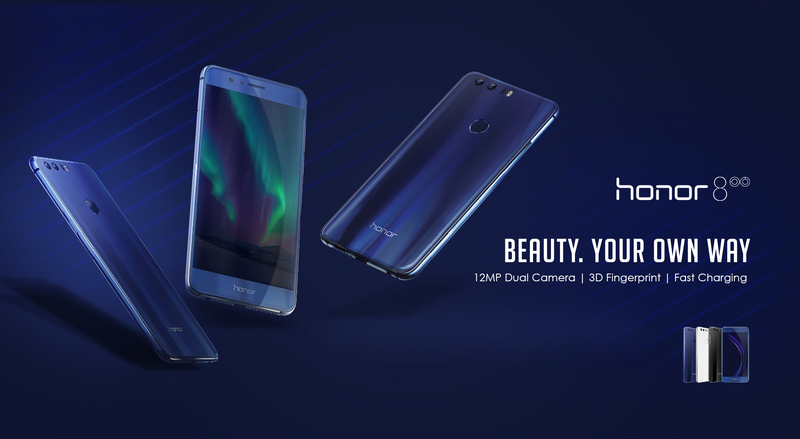 Honor’s newest flagship device, the much-anticipated Honor 8, has officially launched in Europe, bringing state-of-the-art mobile and camera technology into the hands of digital natives, at a price tag of just £369.99. Every generation has its own idols, its own point of view on the world and its own rules. The Honor 8 has been specifically designed by Honor, the leading e-commerce smartphone brand for digital natives, to meet the ambitious, fast-paced lifestyles of this generation. It combines breakthrough design with supreme speed, high-quality camera capabilities and smart functions, making it the perfect match. Encased in glass, which is made from fifteen layers of Process on the back, the handset’s sleek 5.2 inch design has an unrivaled finish. Within the layers are lithography and 3D grating coatings that come together to create lots of fine prism lines. Although invisible to the human eye, these generate bright colours for a stunning visual experience. Thanks to its 2.5D curves, the glass fits seamlessly into a diamond-cut metal frame making the device exceptional to hold, and acts as a protective layer against occasional drops and rough handling. Following with previous models, the device holds a dual camera with two 12 MP sensors; one RGB sensor to capture colours and one monochrome sensor for detail. Minus an optical filter, the monochrome sensor captures three times more light than normal, improving the dynamic range of the image and reducing noise – even in darkness – delivering unparalleled picture quality. The two sensors also enable photographers to utilise a range of filters, from setting focus after the shot to changing the appearance of the Bokeh effect. On top of this, the Honor 8 camera supports an extensive set of functions and filters, from light painting and beauty mode to panorama frames, slow-mo, food mode, HDR, super night and water mark. In a world where we now turn the camera on ourselves, the Perfect Selfie mode will enhance every smile, pout or pose which, when combined with an 8 MP shooter on the front, promises a shareable snap. Perfect every photo or finesse video content with a whole host of editing tools to make your content stand-out whether you post it on Instagram, add it to your blog or print it for your walls. The Honor 8 has been built with a Kirin octa-core CPU chipset containing an i5 co-processor, which work in tandem to increase processing speeds, response times and battery life, making sure you are powered-up when you need to be (4x 2.3 GHz). Supporting this further, the device supports Wi-Fi connections on both bands (2.4GHz/ 5 GHz). Knowing that speed is key, Honor has made sure you can access a full set of functions in the blink of an eye with its unique Smart Key function: the fingerprint sensor acts as a multi-purpose button, where you tap, double tap or tap and hold to start apps like WhatsApp or Pokémon Go. Everything you need to keep your daily routine ticking is at your fingertips. Its Type-C USB sets a new standard in charging ports, bringing an end to fiddling with cables, as the plug fits in no matter how you turn it, on top of enabling super-fast charging in only 30 minutes from 0-50%. Honor 8’s fingerprint sensor has a self-learning capability, meaning the more it is used the faster it will perform, reaching less than 0.4 seconds. The Honor 8 is available from August 24 on Honor’s vMall for an incredible offer of just £369.99, including an anniversary package worth £69.99 (while stocks last). Shoppers can choose from three colors: Pearl White, Midnight Black and Sapphire Blue. At Amazon, the Honor 8 will be bundled with an Amazon Fire TV Stick free of charge (while stocks last). Selected online retailers like Clove, Ebuyer and Expansys will also stock the Honor 8 Sim-free along with it being available on contract exclusively at 3 in the next coming weeks.